Think Costa Rican rainforest, think zip-lining. The two go hand-in-hand, and it's almost impossible to visit and not have a go. 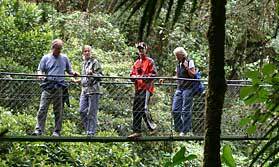 Zip-lines have developed into one of Costa Rica's most widespread and popular activities. Why zip-line? First and foremost, it gives you a completely different perspective of the rainforest. The steel cables and platforms strung at various heights between trees allow the opportunity to reach areas previously unobtainable, secondly, it will undoubtedly get your blood pumping, and thirdly, give you an insight into ecology, botany, wildlife and also the sustainability of the country. 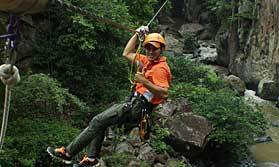 Zip-line tours vary in duration depending on where you choose to do it. It can take an hour and some can take two to three hours to complete and may be combined with hiking, Tarzan swings or hanging bridges. One thing is for sure, once you've finished, you'll want to go back to the start! You will find zip-lines throughout the country. 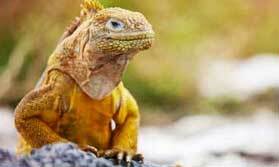 The most popular ones and some of the best can be found in Monteverde, Arenal and Manuel Antonio. The time of year doesn't really matter, although it will be more enjoyable if it is not raining heavily. Tribes can easily incorporate a Zip-line Tour into your itinerary for you, everything can be arranged before hand. If you prefer to be flexible then these can be booked whilst you are in Costa Rica, often via your accommodation but may require 24 hour advance booking.